This guide is for the console version. For the Game Boy Advance version, see The Sims: Bustin' Out (Game Boy Advance). 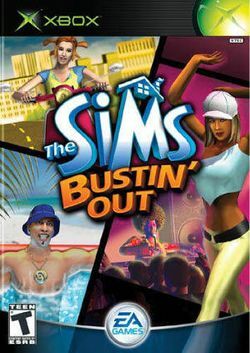 The Sims: Bustin' Out is the second title in The Sims console series. Bustin' Out was released for the PlayStation 2, Xbox, Nintendo GameCube, Game Boy Advance and N-Gage in the fourth quarter of 2003. As the title suggests, Sims can get out of the house to visit other locations such as Shiny Things Lab or Casa Caliente. There are two modes. Bust Out Mode which has mission based gameplay and Freeplay Mode which is open-ended gameplay very much like the original The Sims PC game. In the console version, Malcolm Landgrabb is going around the neighborhood, repossessing items in return for unpaid rent. The player's objective is to complete each career track, unlock and buy back everyone's possessions, and become rich enough to evict Malcolm from his mansion and move their own Sim in. This page was last edited on 30 November 2009, at 00:04.